The difference between an audiologist, ENT, and a hearing aid dispenser is sometimes confusing to people. They each perform vital functions in the hearing health field, but there are distinct differences among them. Knowing the difference can help you find the right hearing health professional. The difference between an audiologists, ENT, and a hearing aid dispenser is sometimes confusing to people. Hearing Aid Dispenser: The definition of a hearing aid dispenser as set out by the government in The Laws and Regulations of Hearing Aid Dispensers, as: “A person engaged in the fitting or selling of hearing aids to an individual with impaired hearing.” In other words, a hearing aid dispenser is licensed to engage in the fitting and sale of a very specific thing—hearing aids. They have the ability to test hearing, but only as those tests relate to the fitting and sale of hearing aids. A hearing aid dispenser is licensed, and many times will work with other hearing health professionals to ensure a patient receives comprehensive evaluation and diagnoses. Audiologist: An audiologist is a hearing health professional with eight years or more of education in hearing and rehabilitation of hearing. A Doctor of Audiology (Au.D.) or what most people call an Audiologist is educated and trained to prevent, identify, and assess hearing disorders, as well as to provide treatment—including hearing aids and other assistive listening devices. An audiologist is typically trained in Speech-Language Pathology & Audiology/Communication Sciences and Disorders before they even begin the four year program necessary to become an audiologist. To put it simply, an audiologist is a hearing doctor. Ear, Nose, and Throat (ENT) or Otolaryngologist: Otolaryngolgoy is the Latin name for ear, nose, and throat. An otolaryngologist or ENT is a highly specialized doctor trained in the treatment and diagnoses of problems with the ear, nose, larynx (voice box), and throat as well as the head and neck. Training includes four years of college, four years of medical school, and five years of residency. ENT training sometimes includes two years of general surgery, allowing these professionals to perform surgery on cancers and other serious conditions arising within the ear, nose, and throat. 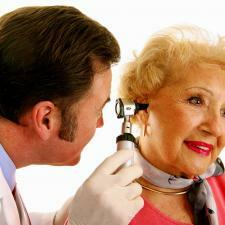 Finding the right hearing health professional depends on a patients goals and needs. A hearing aid dispenser can help with finding a hearing aid, an ENT can assist in determining hearing loss or other disorders of the ears, nose, and throat, and an audiologist knows and understands hearing loss. The best hearing health professionals are those that typically understand the emotional as well as physical issues involved with hearing loss and are very familiar with the fears and problems that can arise from this complex condition.